A plum is a shazif שזיף. I thought shazif is a prune. So when King David says "sheshzafatni ha-shamesh" he is saying he is tanned from the sunned, i.e., all dark and wrinkled like a prune. But I guess you can be dark like a plum too. The 1917 JPS translation has a translation similar to Ari's: "Look not upon me, that I am swarthy, that the sun hath tanned me". But the New JPS translation is different: "Don't stare at me because I am swarthy, because the sun has gazed upon me". So what does the root שזף mean - "to tan, to scorch" or "to gaze"? to catch sight of, look on; to blacken, brown, tarnish; to become sunburnt. [For sense development, cp. Arab. laha ( = came in sight, became visible; it parched, scorched, tanned - said of the sun). On the other hand, he says that שזף is related to שדף - a term meaning "to blast, blight, scorch" - and with no connection to sight or gazing. I have to say, I am a little confused. It would seem to me that every occasion of שזף in the Tanach means "to gaze". I can't even find any later Talmudic sources where it means "to scorch", other than midrashim on the same verse in Shir HaShirim, where the meaning "scorched" is certainly influenced by the first half of the verse quoted - "I am black". Maybe a reader with access to a large database can tell me where the earliest sources are where שזף clearly means "to scorch". Let's move on to our second assumption. Is shazif שזיף related to שזף? But I think the source might be in error. I found reference to dormaske דורמסקין - Bava Kama 116b and Brachot 39a (the English word damson has the same root) and pega פגעין - Shabbat 144b. (Interestingly, Rashi in all three sources translates the fruit as פרונ"ש - prunes. More about that a bit later.) 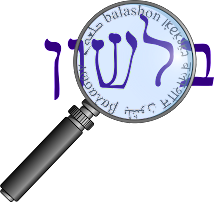 And the Yerushalmi (Berachot 6) mentions achvanaya אחונייא (the spelling "ahonit" above was mistaken - it should be read אחוונית ahvanit). But no shazif. The word שזיף was borrowed by the Greeks, in whose language it became zizyphon, whence Late Latin zyzyphus (= jujube tree). The word jujube itself is a loan word from French jujube, which is ultimately borrowed from Greek zizyphon. If that's a little hard to see, just notice the pattern of two sibilant letters and a bilabial. And what of the shazif - שזף connection? Klein denies it. He says shazif is a foreign word, and that the connection between shazif and the "blackish color of the plum" is a folk etymology. So far we've established that שזף didn't (perhaps) originally mean "to blacken, scorch", and shazif wasn't originally a plum. What is our third mistaken assumption? This one actually is related to English, not Hebrew. Our distinction between "plum" and "prune" is somewhat artificial. Notice how Rashi translated the Hebrew terms for plums using the French word "prune". Well, both "plum" and "prune" derive from the same source - the Latin prunum. The switch from "pr-" to "pl-" happened in German (and later English), but in French prune still means "plum". However, in today's English, the distinction between plum and prune does exist. In fact, William Safire writes in The Right Word in the Right Place at the Right Time that due to the negative connotation of "prune", the California Prune Board changed their name to the California Dried Plum Board. While this change proved rather controversial in Safire's article (particularly the contradiction in terms "dried plum juice"), in Hebrew it's no big deal: prunes are shzifim meyubashim שזיפים מיובשים - dried plums.